“I went outside with Pat just now and we are still taking it all in. It is beautiful. Our neighbor from on high (who we never spoke to before) actually walked out, and looked over to say it is beautiful. Thanks for making our house a home and for giving us the garden of our dreams”. “There are a few things in life that are critical to find and hard to get–a good doctor, a good tailor and a good landscaper. Thanks for making our yard beautiful and for your friendship”. “This is one of the very best contracting experiences my wife and I have had. 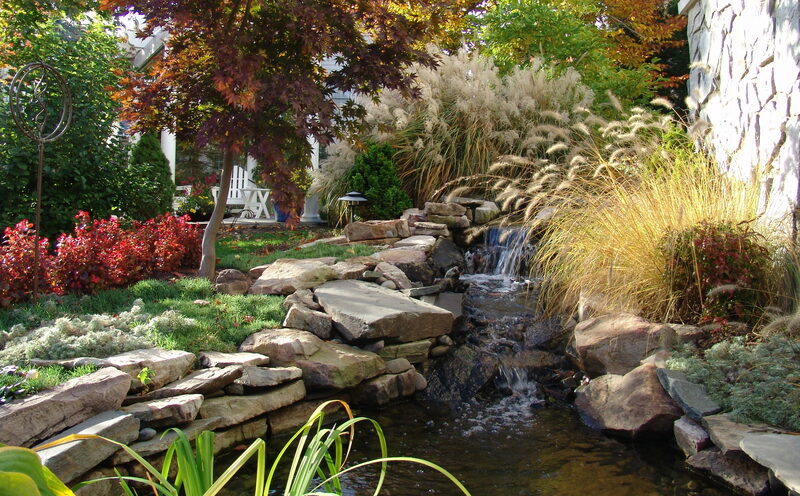 Our Project Manager and Landscape Designer showed a true passion for her work”. “I couldn’t be more pleased with the results and they finished a couple of days ahead of schedule. Really remarkable company”. “We recently had a gathering of neighbors at our home. We had set up refreshments in the dining room. However, once our company saw the patio, we were unable to get them back inside. That is a testament to Professional Grounds, Inc. superior performance”. “Working with Professional Grounds, Inc. is kind of like having a professional landscaper in the family”. “Amazing…They constantly worked hard, paid attention to detail and were incredibly polite”. “The foremen who build the walls in both front and side [of the house] is a consummate professional and an artist”. “Special thanks, long overdue, to the Area Manager and crews for the extra work they did in cleaning up all of the grounds before the end of the year”. “Thanks so much for all the planning and programming you do to stay on top of the big and little things that need doing around our properties; I am truly glad you are in my corner. Thanks so much for your attention. Look forward to seeing a lot of you this year”. “I promote GOOD companies that perform and charge the right price. Professional Grounds, Inc. quality and performance is OUTSTANDING…THANK YOU for making my job easy”. “The Chairman of our HOA’s Architectural Review Committee told me that our ‘yard looks super!’ and added PGI to the list of vendors on the Association’s website in hopes that other residents will choose Progrounds for their future projects!”. Our mission at Professional Grounds, Inc. is to create valued relationships with our clients through extraordinary service and personal attention. We are a privately-owned family business serving commercial sites in Northern Virginia including Fairfax County, Arlington County, Loudoun County, as well as the Cities of Alexandria, Falls Church, and Fairfax. © 2018 Professional Grounds Inc.